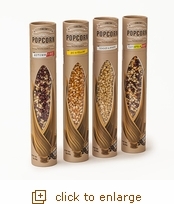 Flavorful Medley: Something for every popcorn lover! The mix of red, blue, white and yellow kernels each offer their own unique size and taste for a flavorful blend of white and yellow corns when popped. " Big & Yellow: Made for lovers of big, fluffy popcorn (think theater style). Tender but with plenty of size, these golden yellow kernels pop up crunchy and delicious. When popped, each kernel has a ""butterfly"" shape, meaning the ""wings"" of each piece are perfect for catching toppings of all kinds. "